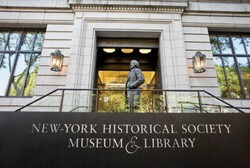 Join us as we visit the New-York Historical Society. A guided tour of "Mapping America's Road from Revolution to Independence" will start our day at the N-YHS. This exhibition showcases hand-drawn and engraved maps from the 18th and early 19th centuries that illuminate the tremendous changes--geographic, political, and economic--that occurred before, during, and just after the Revolutionary War. The exhibition features rarely displayed manuscripts and printed maps from New-York Historical Society's own premier collection, including the original manuscript surveys of Robert Erskine, Geographer and Surveyor-General of the Continental Army, and his successor Simeon De Witt. "Hotbed," which explores the vibrant political and artistic scene of Greenwich Village in the early 20th century, when men and women joined forces across the boundaries of class and race to fight for a better world. At the heart of the downtown radicals' crusade lay women's rights: to control their own bodies, to do meaningful work, and, above all, to vote. "The Viet Nam War," a groundbreaking exhibition on one of the most controversial events of the 20th century. Populating a 3,000-square-foot gallery with interpretive displays, digital media, artwork, artifacts, photographs, and documents, the exhibition provides an enlightening account of the causes, progression, and impact of the war. Spanning the duration of U.S. involvement in Indochina from 1945 to 1975, the narrative incorporates perspectives that cover both the home front and the war front.